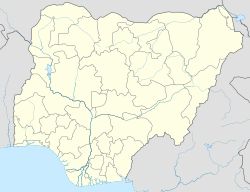 Osogbo (also Oṣogbo, rarely Oshogbo) is a city in Nigeria. It is the capital of Osun State. Osogbo city seats the Headquarters of both Osogbo Local Government Area (situated at Oke Baale Area of the city) and Olorunda Local Government Area (situated at Igbonna Area of the city). It is some 88 kilometers by road northeast of Ibadan. It is also 100 kilometers by road south of Ilorin and 115 kilometers northwest of Akure; Osogbo shares boundary with Ikirun, Ilesa, Ede, Egbedore and Iragbiji and is easily accessible from any part of the state because of its central nature. It is about 48 km from Ife, 32 km from Ilesa, 46 km from Iwo, 48 km from Ikire and 46 km from Ila-Orangun; The city had a population of about 156,694 people as of 2006[update] according to the census; the postal code of the area is 230. Osogbo lies on the railway line from Lagos to Kano. It is known for the Osogbo School of Art and the Oja Oba Market building, said to be the former Oba's palace, within yards of the Osogbo Grand Mosque. Osogbo is the trade center for a farming region. Yams, cassava, grain, and tobacco are grown. Cotton is grown and used to weave cloth. It is also home to several hotels and a football stadium with a capacity of 10,000 and a second division professional league team. Most of the population are members of the Yoruba ethnic group. In 1988, about 27% of the population were engaged in farming as their primary occupation, 8% were traders and about 30% clerks and teachers. Osogbo, sometimes called "Ile Aro" (home of dyeing), is a major dyeing center. The traditional industry is one of the major industries of Osogbo. A number of industries also began to rise after independence, notably small scale establishments involved in textile, foam making, and pencils. Osogbo was made a major industrial development center by the government of Nigeria during the 1970s. Osogbo is also the childhood home of the actor and dramatist Duro Ladipo and the Muslim scholar Sheikh Adelabu. Osogbo is the venue of the annual Osun-Osogbo festival along the River Osun. The festival is centered on the sacred grove of the river goddess Ọsun, which is a UNESCO World Heritage Site. During the reign of Oba Olarooye at Ipole, life became very unbearable because of incessant dry seasons. The then Ipole people became much dejected, worried and uncomfortable over their losses involving their farms, domestic animals and human beings. The Oba Olarooye was worried and disheartened by the situation at Ipole Omu. He wanted emergency solutions to inevitable and uncountable losses. This was the time he ordered the chief hunter at Ipole-in the person of Timehin-and his co-hunters to go on expedition and look for greener pastures. Timehin and the other hunters courageously took up the challenge and moved out in search of a better place for settlement. The expedition discovered River Osun. Yoruba tradition claims many people fleeing the Fulani Invasion settled at Osogbo following the fall of old Oyo. As a result, Osogbo increased in population largely due to migration from other Yoruba towns. For want of a more open place than a grove and a more central location, Larooye and his people abandoned their settlement, including the already flourishing market and moved to Ode-Osogbo. At Ode-Osogbo, Larooye built his new palace at the present-day Idi-Osun while Timehin built the Ogun shrine now known as Idi-Ogun. Since then, Osogbo has maintained its function as an economic center. ^ "Welcome to Osogbo City Homepage". OSOGBOCITY WEB. Archived from the original on 2013-11-16. Retrieved 2013-06-21. ^ "Osogbo". OSUN STATE GOVT. Retrieved 2013-05-10. ^ "Klimatafel von Oshogbo / Nigeria" (PDF). Baseline climate means (1961-1990) from stations all over the world (in German). Deutscher Wetterdienst. Retrieved 10 August 2016. ^ Tunde Agbola. Osogbo: Cities, Volume 9, Issue 4, November 1992. This page was last edited on 24 June 2018, at 00:06 (UTC).